Did the bus just pass you? It’s not uncommon in Vancouver. This is an interesting article about the reality that many bus commuters deal with on a daily basis. 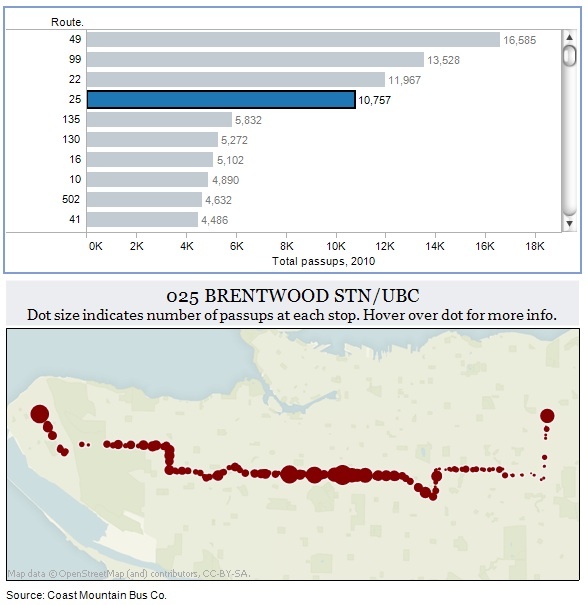 Route #49 is certainly a serial offender, and likely deserves its #1 ranking, but the data provided by Coast Mountain, the TransLink subsidiary that operates the buses, reveals that it’s not necessarily the busiest routes that pass up on passengers. The Sun piece noted that the 49 (between Victoria and Cambie), 25 (between Oak and Fraser – see graphic below), and 22 (on Burrard and Cornwall) are among the top 5 pass-up routes. I think there are some caveats when interpreting this data; as alluded to in the article, one of them is the possibility of understated data, due to drivers not recording passed-up stops when they’re encountered. Another is found in the cartographic interpretation of all the stops of a particular route. The termini of certain routes appear to have inflated numbers for pass-ups. For less busy termini, the data as presented doesn’t make sense. Several examples include the 63rd Avenue loop for the 16, Harrison Loop for the 20, Dunbar Loop and Knight/Marine for the 22, and Brentwood Station for the 25 (eastern terminus in the map below). I’ll just focus on my favourite whipping-route, the 25 Brentwood Station/UBC (or as I’d like to call it, the 25 King Edward-East 22nd). 4th in the most-passed-up list, the 25 is horrifyingly inconsistent in terms of scheduling, likely contributing to its ranking in the list. Unlike the other routes in the top 5, the 25 is unique in that the volume of pass-ups is consistent for most of the route west of Nanaimo Station, and is heaviest between Oak and Fraser. I know that in the morning peak, heading west from Nanaimo Station to Granville, the data displayed in the map are consistent with my personal experience. Westbound at Windsor and Fraser are particularly busy stops and pass-ups are common, It only gets worse the further west the bus travels, simply because the bus has already filled by then and passengers are unlikely to disembark. What makes the 25 interesting compared to the 49 is that even west of Granville, pass-ups are still happening. The Dunbar and 16th Avenue segments are still quite notorious for pass-ups, continuing the trend from my days as a student at UBC. Even the introduction of route 33 doesn’t seem to alleviate the condition. Despite what the article notes are some short-term solutions, including TransLink’s service optimization, the bottom line is that the bus system is woefully under-serviced to keep up with passenger demand, especially in the “peak of the peak”. Hopefully this article can serve as a wake-up call to senior governments to provide additional funding to public transit in Canada generally, and in Greater Vancouver in particular. well, my thing is the 49 bus. my husband and i share a car, and i take transit about 4 days a week. i work in richmond. coming home, if all goes well, takes me 35 minutes: walk to aberdeen station, take the canada line to langara, take the 49 to two stops past fraser. but going? forget it. the worst i’ve experienced was six (6!) 49 buses passing me by before they picked me up. there are just way too many people wanting to get to langara college, the canada line, or UBC. the upside is that i now walk to the langara station. takes me a bit over 30 minutes, and it’s a great walk – except for the days when it rains. At least you have another month or so before the weather turns again! Have you considered walking to Knight Street and taking the 430 to Bridgeport Station? i have but that would not be an improvement. i actually really love that walk to langara station. I take the 25th bus to BCIT every morning typically between 7:30am to 9:00am depending on the day I get on right before the cambie/25th skytrain station. These past months (2013 March – May 8th) the bus has been passing me not full but “Not in Service” and doing so very consistently. 1.) Did this happen to you when you were taking the bus to UBC? 2.) Does “pass-ups” include “Not in Service”? 1. When I used to take the 25 westbound in the morning, there were no “Not in Service” (NIS) buses going my direction. 2. As I understand it, the data used to generate the pass-up maps are from drivers operating in-service buses. So the “Not in Service” buses should not be part of the data. Perhaps the NIS buses are going to Nanaimo Station to do those westbound runs that start from there? 25 is the worst bus ever, especially from nanaimo to BCIT. nothing can explain how frustrated I am with this route and how many days I’m late because of it. Being early doesn’t always help with this line as sometimes you have to wait for 45 minutes before a caravan of 3 buses show up suddenly. To make it worse, this bus passes by retirement home alley and Burnaby hospital then geek alley (EA sports area) before even reaching BCIT. So to have the buses late all the time and packed like sardine cans when you have so many seniors taking it is just nauseating. Just hate translink because of this stupid route.